Hair coloring is the new -"Makeup for Hair " and it cannot be overlooked coz self confidence is factoring into self-image lately. Need a boost of confidence ? Or wanna change the way people perceive about you ? Then better be the color chameleon !! 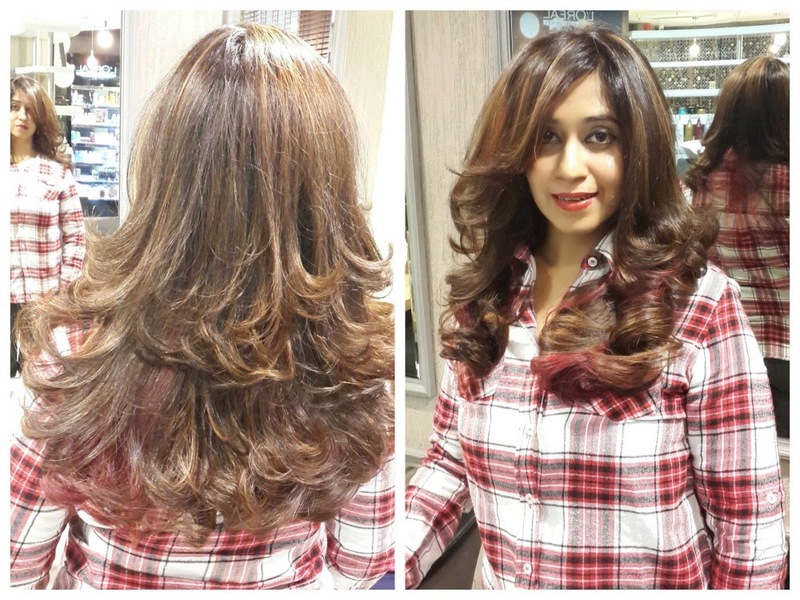 Its been two months since I got "High- Art "Red highlights from Geetanjali Salon. I loved the whole experience and my priceless look post that, which fetches me lot of compliments(till date ). Not to forget, it was first time I experimented with different colors. And with the tiny maintenance , I was able to retain the color for this long too. 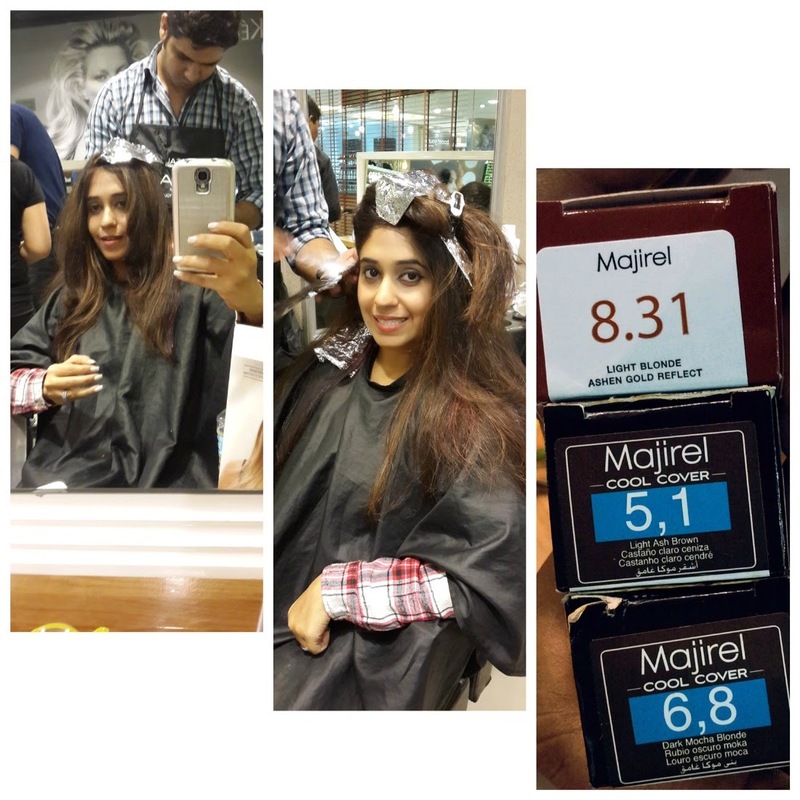 The people at Geetanjali's knows my love for being wacky, hence called me over last week for a session with the industry's most consulted color expert- Sumit Israni, for hair color assessment, and add on some more color to my hair and persona . They had a huge promotion recently at the Ambience mall- vasant Kunj salon, (btw like their facebook page to stay updated on all their activities ). Sumit knew exactly what I needed, better still assessed that my winter-drab brown hair needs a lift and prescribed a trio of highlights in blonde, Fucshia and Mocha to compliment the honey colored streaks I had on from before. Seconds after I nodded my approval, he instantly instructed Pammi(the expert from the hair color academy) to began mixing up a hue, and apply from my roots. I had gone with an intention of chalking my hair to a lavender or a Blue, but with Sumit, there is always a confident approach, which won me into not going for it this time. Though I would love to bring you the best of hair Chalking from the expert himself, but it was the gut , with which I went by this time, and a pacifying thought, that he has something else to beef up my hair in the chalking department, which I would experiment sometime later. I didn't anticipated that this veteran would take nearly 7 hours to weave the color I wanted in my hair ,and I almost ran out of patience, But the minute my base was evened out , my soft, and newly radiant hair screamed "gorgeous " !! The color alone was worth a thousand words. While I was initially amazed by just how bright the results looked, I eventually fell in love with my blonde ribbons and the way they added depth and volume to my superfine tresses now. I had been raving about my haircut last time I got from them. The people at Geetanjali understand hair better than any other and this time as I watched Sumit slice my hair I realized it was exactly what I was after !! There is a way in his tousling and snipping that each strand just falls right. Post 5 minutes, and I was ready with a sultry, artfully, disheveled result -long on style and Bang factor. The verdict? I love the neater version of my hair. The color looks great, and with team from Geetanjali now by my side, think I can afford to change my hair at a whim !! Wow! Your hair is looking just gorgeous! Those blonde stripes look really really good! I simply LOVE ur Outfit !